Suntuitive by Pleotint | CrystaLite, Inc.
Standard and UL Certified Models. Curb mounted and self-flashing options available. Structurally designed custom systems - stamped by an independent structural engineer. Structural addition to your home or business. Curb mounted and self-flashing models available; with plastic glazing option. Curb mounted, self-flashing and gable mount models available. Products that take your project to the next level. CrystaLite is a Northwest Washington manufacturer of high quality skylights, roof glazing, sunrooms, and railing systems. Our suppliers are also local businesses and employ local workers. We are a dealer based manufacturer. Look for our products at your local lumber yard and glass shops. Please call our sales representative in your area to find our products at a dealer near you. CrystaLite is a Northwest Washington manufacturer of high quality roof glazing, sunrooms, and railing systems. We welcome your inquiries; our qualified sales staff is always available. Suntuitive is a thermochromic interlayer for dynamic windows which lightens and darkens by itself – with absolutely no mechanical or electrical intervention – based on heat from direct sunlight. The system maximizes natural daylight while minimizing solar heat gain. No power supplies. No maintenance. As part of a dynamic window system, Suntuitive can help manage a building’s changing needs for passive solar heat gain and natural daylight. All together this can lower costs associated with heating, air conditioning and artificial lighting. Suntuitive also provides all of the benefits of a safety laminated window. Suntuitive puts the view back in windows again by reducing the need for shades, blinds and other devices that block your view. 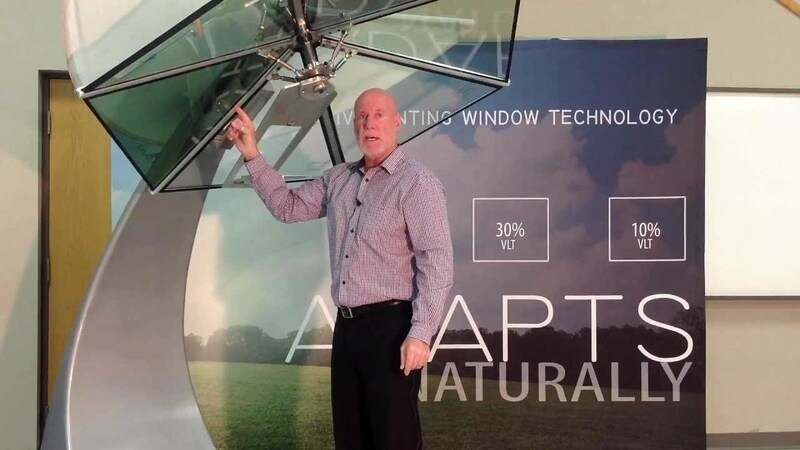 With Suntuitive, architects, building owners, building professionals and home owners can specify an adaptive window system that transitions seamlessly between light and dark throughout the day, every day of the year. Simply put, Suntuitive is the next generation of glass technology and provides the ultimate in comfort and view. The patented Suntuitive interlayer is made with polyvinyl butyral (PVB) and is extruded on their own equipment. It is the first functional, adaptive glazing, interlayer for use in an IGU (insulated glass unit). Pleotint supplies their Suntuitive tri-layer (as a single interlayer) to companies that make safety glass laminates. Suntuitive interlayer must be laminated between two panes of heat strengthened or tempered glass. The laminate can then be made into a double or triple pane depending on the performance needed. Suntuitive uses the sun’s energy to passively tint the window. As the sun strikes the window it absorbs and changes tint level based on the amount of sun. There are no wires, power supplies, or mechanism systems required. The directness of the sunlight on the window determines the level of darkening. Cooling the interlayer causes it to lighten back up in a continuous manner as the temperature decreases. Suntuitive has passed impact, boil and pummel tests outlined by the U.S. Consumer Product Safety Commission (CPSC). The optimal IGU should include a glass pane with a high quality low emissivity coating such as Solarban 60 or Solarban 70XL from PPG, or similar. Depending on the tints and low-e glass selected, vertical IGUs made with Suntuitive interlayer can produce visible light transmittance (VLT) as high as 60 percent in a clear state and solar heat gain coefficients (SHGC) as low as 0.11 in a darkened state. Pricing now available on Fasterbids with your free membership! Fasterbids allows you to create fully editable project quotes in minutes with products from all the top manufacturing brands in the window, door and skylight industry. CrystaLite product pricing available at no charge with your basic (free) Fasterbid membership.